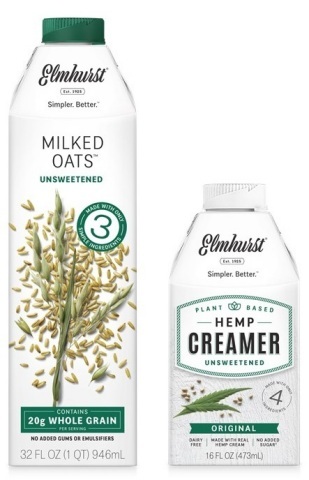 Elmhurst® 1925, maker of simple, nutritious and incredibly delicious plant-based nut and grain milks, today launched Original Unsweetened Hemp Creamer and Unsweetened Milked Oats™. The first hemp creamer on the market, Elmhurst Original Unsweetened Hemp Creamer is crafted with just four ingredients, including real hemp cream, while Elmhurst Unsweetened Milked Oats is made with only three ingredients: oats, water and salt. Elmhurst has also launched Unsweetened Milked Oats in tandem with the new creamer. Introduced to meet consumer demand, Unsweetened Milked Oats is the counterpart to the brand’s beloved Milked Oats™ sans added sugar. Made with just three ingredients – oats, water and salt – this plant milk is free of added gums or oils, contains 20 grams of whole grains per serving and is stamped by the Whole Grains Council. The high-quality and nutritionally robust oats used in Unsweetened Milked Oats are sourced from the Red River Valley of Manitoba, Canada. Elmhurst Unsweetened Milked Oats is perfect for drinking by the glass, stirring into oatmeal, mixing into smoothies and more.